New programs, new coaches and expectations of success are the key talking points for College of Staten Island athletics as the College’s programs gear up for a new year. The women's soccer team won it all in 2017-18. Can they repeat? Expectations are particularly high because last year CSI won the CUNYAC Commissioner’s Cup, awarded to the conference’s highest-achieving athletics program. Women’s Soccer, Men’s Basketball, Baseball, Softball and CSI Cheerleading all brought home CUNYAC Championships a year ago. This fall, pre-season coaches polls have selected both men’s and women’s soccer to finish in the top spot, and CSI figures to be near the top in their perennial power sports, such as men’s and women’s basketball, and baseball and softball come spring. A lot of anticipation surrounds the Dolphins’ racing circuit, as in addition to Men’s & Women’s Cross-Country, Men’s & Women’s Indoor and Outdoor Track & Field has been added to CSI’s list of varsity sports. The Dolphins are looking to burst on the competitive scene as early as this year and compete immediate for individual and team conference honors right out of the gate. The cross-country and track & field programs are a half-dozen sports that will inherit a new coaching staff in 2018-19. Part-time men’s and women’s tennis coach Joseph Gravagna represents two others. CSI Women’s Tennis won a pair of CUNYAC Championships in 2013 and 2014, but has been shut out since. The men’s unit is on a CUNYAC Championship drought, having not won a title since 2003. Gravagna is eager to get the competitive level raised for both programs, despite being hired just a handful of weeks ago. 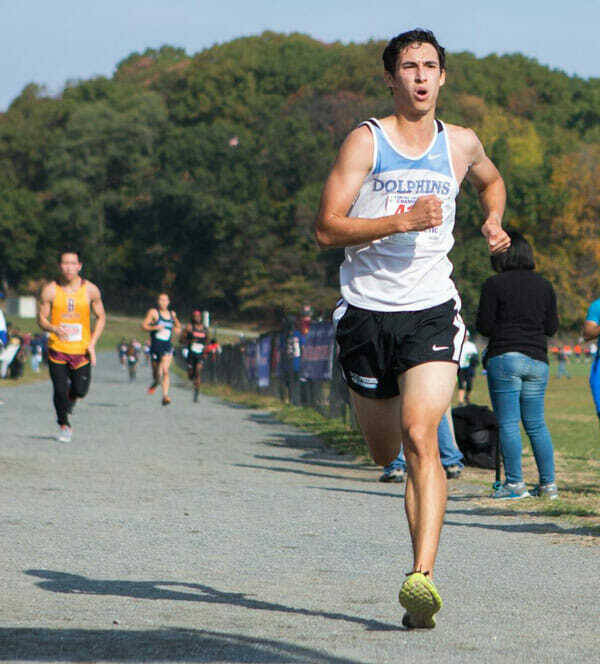 Liam McMunn will be a focal point for men’s cross-country and track & field in his senior year. Brittany Casares, the new women’s soccer coach, sees her team start the year off on the road at Kean University on August 31. Casares is in a much different position than Gravagna, inheriting a proven winner, as the Dolphins have captured the CUNYAC’s last three championships and nine overall since the school adopted the sport in 2004. Casares’ appointment came with CSI moving the coaching position from part-time to to full-time line (Equipment Manager duties were added to Casares’ plate), something that Gomes has been striving for since taking over the program just over five years ago. CSI’s final rookie coach is Nicole Sarcone, who will make her collegiate debut this winter with women’s basketball, a team that took home a Championship two years ago and made a return trip to the Final in 2017-18. The rub, however, is that the team lost nearly 75 percent of its scoring offense a year ago, and seems destined for a rebuild unless the coach can turn the tide. The new coaches are enough to generate a buzz around the facility, and they accompany the addition of Erin Van Nostrand, who became CSI’s second Associate Athletic Director in the program’s history, doubling as it’s Compliance Officer, and men’s basketball head coach T.J. Tibbs, another coach who was elevated to full-time with additional duties as Camps & Clinics Coordinator. Tibbs brought home a CUNYAC Championship in 2018-19. Head Softball Coach Stella Porto, whose 16-year career is the longest among all CSI coaches, brought home the team’s sixth-straight CUNYAC title last season, and baseball skipper Michael Mauro brought home the team’s fourth-straight Championship on the same day. In 2019 in baseball, the CUNYAC will partner with the NAC to provide a national championship tournament berth to the combined conference winner, a major move ahead for the sport. To say that the trajectory doesn’t remain high for CSI’s highly-competitive sports like these would be an understatement. CSI leading scorer Joe Bollela is back for his sophomore season on the men’s soccer team. 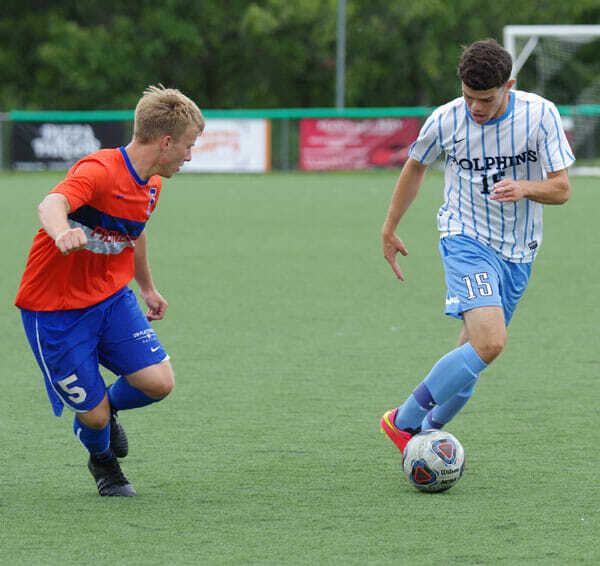 The Dolphins complete the athletic year with the emergence of sports like Men’s Soccer, who figure to be chasing a CUNYAC title that has eluded them since 1998. The team has won a pair of Regular Season titles under sixth-year Head Coach John Tardy and promise to be in the mix again this season. Head Coach Michael Ackalitis pioneers the swim programs, who will face a challenge this season as upgrades to the Sports & Recreation Center facilities have kept the pool offline this summer and perhaps into the training season. Still, CSI hasn’t dropped past a third-place finish on either the men’s or the women’s side in over a decade. Rounding out the hopefuls for a quality campaign are the men’s and women’s volleyball units. Head Coach Lak Wai (Larry) Ng took over the programs during the late-summer in 2017, and now with a full off-season under his belt, hopes for a climb through the standings in year two. CSI Cheerleading, a club sport at the College, won the CUNYAC title last year, and the team has no intentions of giving that up under second-year coach Kristie Perrotta. CSI has certainly had its share of winning, attested by the 102 CUNYAC titles the program has collected since it’s debut in 1976. The unparalleled performance a season ago gave the program its second Commissioner’s Cup in history last year, and the first since the 2000-01 season. The Commissioner’s Cup weighs each CUNYAC school’s 10 highest-achieving programs and awards points depending on finish. Gomes has enjoyed the trophy’s stay within the department’s Student-Athlete Study Lounge, seeing it as a constant reminder to the hard work and effort his programs exude. Most home events at CSI are free and all events are PG-CLUE Certified for all CSI Students. Home soccer, volleyball, basketball, swimming, baseball and softball contests are broadcast live via CSI SportsNet, and many sports feature live in-game statistics. Complete schedules are available via www.csidolphins.com.